Villa Niccolai Lazzerini, situated north of the city walls near the Brana river, in the “Bigiano basso” region, is a building composed of three floors, facing south, whose windows are enriched by trompe-l’oeil cornices, which, in neo-manneristic, architectural language, may be found in this area since the XVIIII Century. The present aspect of the villa is composed of decorative architecture as wished by the Niccolai family who bought it in 1863, even if some elements of the many transformations carried out since the XVII Century can still be traced. 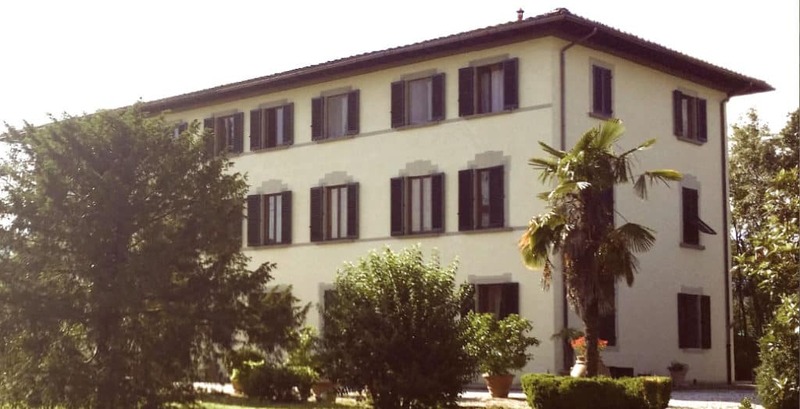 The building was documented as a “villa” dating back from at least 1671, when it had been part of the patrimonial estate of the Fabroni family, who in that year, placed the villa for sale “et oratorio et un podere unito insieme con la casa da lavoratore, aia, forno, pozzo et sue ragioni”. Apart from the oratorio, the wine cellars situated on the west side of the building, appear to belong to the architectural plan of the 600s; the diverse mural thicknesses of the walls and of the south-western edge (90 – 100cm) of the ground floor room, which is currently used as a dining room, could suggest that the building in the XVII Century took the form which reminds one of a “torre appalagiata” (tower-shaped construction). The 1671 document refers to a “Villa with patronal house” (“villa con casa da padrone”) thereby indicating the building was undergoing a transition from a late-medieval type residence to the renewed typology of “villa, in fact, in accordance with the tendencies in act in the Grand Duchy, between the XVI and XVII Centuries. The trace of coexistence of the two construction nuclei in different times is present in the rear façade of the villa where various-sized windows open and which are not arranged in a regular sequence, as appears however in the front façade. Windows of small, closely-set dimensions open at the extreme right on the north side, and correspond to an ambient of smaller dimensions in respect of those in the eastern area and are also of inconsistent planning, a sign of repeated adaptations. The acquisition of the property on the part of Lorenzo Bellincioni (1671) brought about modifications both to the villa and to the interior architecture of the San Bartolomeo oratory, situated near the living quarters, at the end of one of the orthogonal axes, which are centred in the villa. The east-west axis is tangential to the small oratory, which functions as a noble chapel; this is composed of one room, covered by a vault, with the altar which ideally subdivides the sacred space in the area for the faithful and that dedicated to sacred furnishings, in the form of a small sacristy. Referring to the 700s plan of the chapel, there remains the altar with its convex, paliotto frontal and supporting consoles in volute form, in an extroversive position according to late baroque fashion. The restructuration work of the chapel was probably taken on by Giuseppe Bellincioni in order to adapt the building to the times, coinciding with his admission as a patrician citizen which took place in 1755. The present version of the San Bartolomeo chapel’s exterior dates back to the XIX Century, created with a taste of historical inspiration, much in fashion at that time, which illustrates the return of medieval decorative languages: in this case, there are Romanic and Gothic elements. The exterior of the San Bartolomeo chapel still conserves the qualification due to the painted plaster with dichromate bands; in the upper section, trompe l’oeil geometric marquetry is present in the lower gutter. The chapel conserves the mortal remains of Giuseppe Scarfantoni, of his wife Costanza and of their two sons: Francesco and Alessandro. The ownership of the villa by the Bellincioni family was evidenced by restructuring and modernization work which brought about the realization of a building, very close in the disposition of volumes, to the present structure as, already at the end of the XVIII Century, the villa consisted of “eighteen rooms” which correspond (without taking into consideration the subsequent and therefore more recent partitioning, evidenced by the presence of minor section wall thicknesses), to the current number of rooms in today’s Villa Niccolai. Bellincioni family’s commitment also extended to garden architecture; a 1792 document affirms the presence of “a walled-orchard for gardening usage”. As from the second decade of the XIX Century, the Bigiano villa became the villa of the Scarfantoni family who used it as a place for relaxation and entertainment away from the city, enriching the gardens with varieties of citrus fruit and various flowers (“varianti fiorami”) creating a laurel grove and a kiosk at the rear. All the green architecture, of which the water supply “complete with tubs” was part, disappeared over time; all that is left are the iron gates with the Niccolai Lazzerini family stem on them. A “stable with a store and small comfortable, embellished structures” completed the villa’s dotation. Torello Niccolai, a “public works entrepreneur” bought the Bigiano villa in 1863; It is evident that Niccolai was fully aware of the architectural characteristics of the building and its surroundings. It was he who was responsible for the works of internal qualification together with decorators present in the city in the second half of the 800s. The architectural interpretation of the large hall on the ground floor recalls the presence of large two-faced trompe l’oeil casings with rosettes, held in place by plaster strips which bring to mind models of civic architecture known as “identitarie”. Villa Niccolai’s large hall offers access to the garden by means of monumental corridors, which leads to the landscape, with the laurel woods at the rear of the villa. The rooms next to the hall present iconographic programmes which indicate their usage; the dining room, to the left of the hall, presents medallions with “gastronomic” still life of fish and game, while the ceiling in the hall on the right is decorated with panoplies of playing cards. The interest in the Bigiano villa and its valorization, continued with the son, Sabino Niccolai who in 1896, modernised it with an avant-garde heating system, installed by the Florentine engineer Dante Parenti; other rooms on the second floor were later redecorated with a series of refined liberty paintings. Both the walls and the ceilings are perfectly conserved.